Back in the early '90s, my then-boyfriend and I were traveling to San Diego in July. By the time we got to Yuma, it was hot, glaringly bright, and the A/C couldn't keep up. By the time we got to El Centro, it was brighter (2pm) and hotter. (120 deg F) I was fading fast. Then, it was the sight of this fertilizer tank, with the words, "sea level", marked with a line half way up the tank, that made me feel like I was about to dry up and blow away out the window. "Below sea level!!!" I exclaimed in disbelief. I felt like I was sinking down into Hell, taking all the heat with me. At the time, we were attending college up at 7,000 feet altitude, so it was quite a difference from everyday life! The boyfriend became the husband a few years later, and last week, we came by this way again, with the kiddos. Thank goodness it was January instead of July! 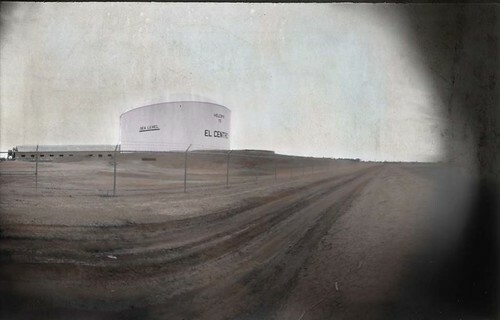 Husband pulled off I-8, and found the dirt road along the fence line, so I could get my pinhole of the tank. Two employees road up in their little golf cart, leery of what we were doing. We excused ourselves as crazy tourists, taking a picture of their fertilizer tank, with a metal can. I can't believe they bought it! ps for Husband: Yes, I concede- the tank is on the ((left)) side of the freeway! Too funny!!! What incredible journeys you take! !